Challenge Day 3 (59/100) – I was walking around and looking for subjects to draw in the library when I was invited to try out VR goggles and applications while passing by an event room. I have not really tried any VR applications yet so I gave it a go. There were many goggles available. We were given a goggle face mask and a 5-min-video-brief before we were told to try on the google. There were at least 5 applications to choose from. Obviously I chose the one that has a TRex for the cover design. It is an application that allows user to walk through a Jurassic world. For safety, we were told to sit. The hand held controller or the program would navigate us around without us having to physically walk. It was pretty cool to be able to watch interactive movies as though you are in it. Quite an amazing experience, however the VR goggle was not very comfortable since it does not fit well over my glasses. I wish they make something bigger. Though enjoyable and surpassed my expectation, I couldn’t have a fully immersive experience as there was some light leak through my goggles. Anyway, after the 10 mins try-out, I continued to wander around in the library to get sketches of visitors. 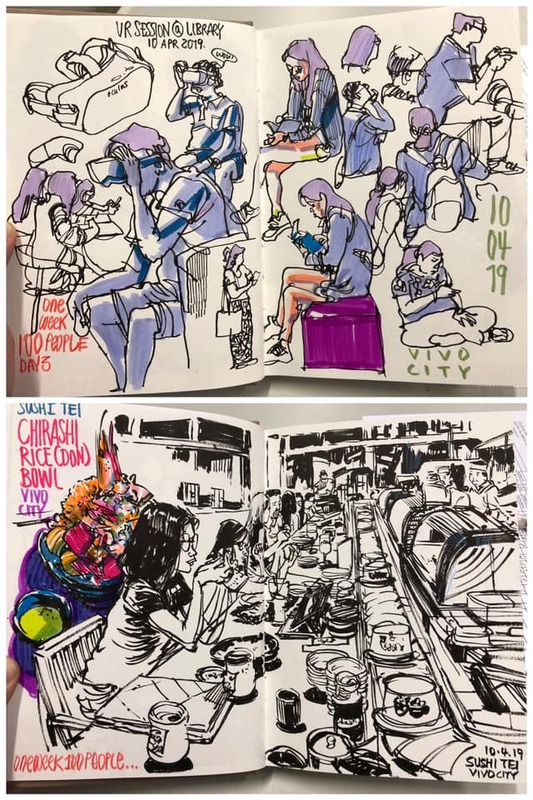 For this round of sketching, my approach was more gestural and I drew mostly with a continuous line for the figures with my fountain pen. Much later during dinner at a Japanese restaurant I turned to brush pen for the scene at the sushi bar, and did a more detailed scene.